Fish, onions, spices and hot cross buns in one sentence would only make a whole lotta sense to the Capetonian. With Good Friday just behind us, I’m sure many have fond memories of a long weekend with yellow fingers. Digging into pickled fish over Easter is certainly a unique Capetonian tradition upheld since … er ..er … time immemorial it seems. 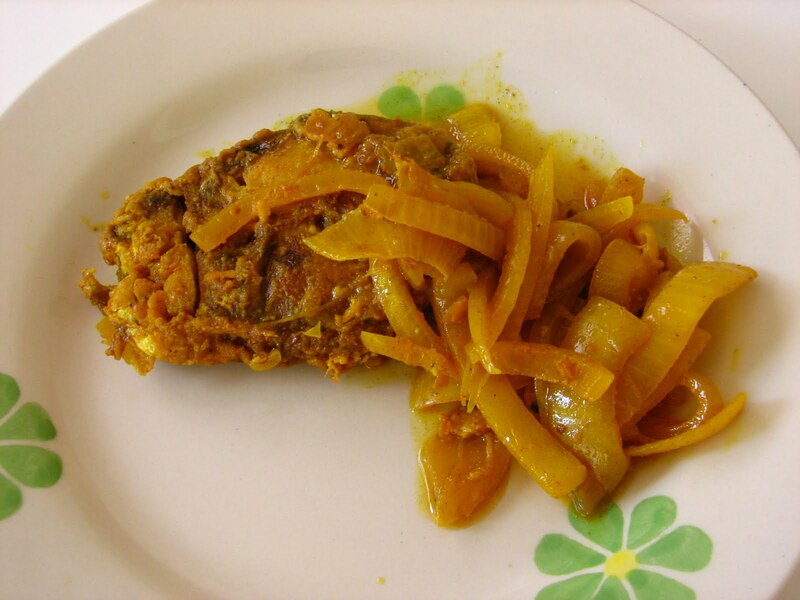 As tradition has it, the scurrying for ingredients and careful preparation start well before Good Friday … the earlier the better cos as we all know … good pickled fish needs its own me-time. Getting back to time immemorial, ever wonder how the tradition got going in the first place? Since pickled fish is commonly known as being a Cape Malay dish, I think it’s safe to assume the tradition’s origin could be as old as say 350 years… or somewhere there around. Here I’m thinking of the 1600 – 1700 time period where slaves from many countries were brought to a new strange world, bringing with them their own unique traditions. Since food and comfort love holding hands… I picture a slave with fond memories of his last meal as a free person. His world is dramatically turned upside down as he gets chained, dumped in a ship and transported to an unknown world where he is to face unimaginable challenges. Unfamiliar and threatening is what his world becomes. Aiding a meek sense of comfort, the slave finds solace in remembering home. And there is no better way to remember home than with home-cooked (traditional) food. For the slave this may have meant adjusting ethnic recipes to include ingredients found in their new strange world. And to South Africa is born a most unique cuisine, the result of a combination of many cultural groups including African, Indian, Malaysian, Dutch. Aren’t we lucky people?? Think you could get this combination anywhere else in the world? I doubt America’s Soul Food is any competition. So today we still enjoy our rich heritage of unique cuisine… bobotie, chutney, koeksisters, milk tart, potjiekos, mashonzha (mopani worms), umngqusho (stamp mielies, sugar beans etc), vetkoek, boerewors, tripe and many more can be celebrated by every South African as a result of our pickled traditions. Back from Leave to this awesome.. You just posted me back to my time off.. Remembering my stunning pickle okay me sommer gonna make another bowl this weekend..Will come in handy when I don't wanna cook next week. That was a Stunning read..
Ek is nou sommer HONGER! !